For other recent pictures of the interior of St. Hedwig's church, click here for a Memorial Day 2002 slide show. Confession - Sunday Morning (Rosary before Mass) 9:00 a.m.
Sunday Morning Bilingual Mass 9:30 a.m.
Holy Days except Christmas & Easter (they usually follow the Sunday schedule and usually a special Mass the eve before.) 7:00 p.m.
Church History St. Hedwig's was founded 1902. St. Hedwig's Parish was organized specifically to serve the needs of Catholics of Polish descent living in the City of Chester and Delaware County. "St. Hedwig's is part of Sacred Heart Church, which serves the Delaware County area. I am pleased to inform you that St. Hedwig's has a sizable Sunday bilingual mass which benefits both Polish and English communities. In November, 2002, St. Hedwig's Church will be celebrating it's 100th anniversary as a community of faith." "We are currently under Sacred Heart Church in Clifton Heights, PA. That is where all our church records are. This is important for people who have left and need birth, marriage records, etc. Address is 316 East Broadway Ave., Clifton Heights, PA 19018, Phone 610-623-0409, [Email]"
In 1977, nothing symbolizes St Hedwig's Parish more than its vibrant and alive spirit. From the turn of the century when the parish was founded to the present time of the 75th Anniversary of the Parish's founding, the spirit of courage, perseverance, dedication, loyalty and sacrifice has remained a characteristic of St. Hedwig's. The history of St. Hedwig's was beautifully presented in the Jubilee Book published in 1952. We do not have the space to repeat nor do we feet the need to repeat the history in its entirety. Instead, we can only highlight briefly the stream of history of St. Hedwig's, pointing to some accomplishments of which our Founders would have been proud. Our historical account covers the era 1952 to 1977, including the 1977 Jubilee Year Celebration. Our founders would rejoice in the beautiful buildings and the Parish Family that resulted from their dreams and hard work. They would be especially happy to know that their names are not forgotten, but well-remembered in the procession of St. Hedwig's milestones through the years. St. Hedwig's story begins in 1902, in the West End of Chester, an industrial city in Eastern Pennsylvania. A group of Polish immigrants - Baltasar Zoladkiewicz, Lawrence Wiechacki, John Kilanowski, and others like Krukowski, Bielawski, Zarebski, Mielcarek, Sielecki, Bielicki and Bessinger - yearning for some visible expression of their native Poland, reached for a dream in their newly adopted nation. With courage, zeal and a strong love of God, they sought a way to worship in their native tongue, a way to express their faith in forms and language familiar to them where their roots were still strongest - Poland and the parish Masses they had attended there. The closest Polish parish was St. Stanislaus, in Philadelphia, too difficult a trip to be made with any frequency. They tried attending Mass at Immaculate Heart Church, Second and Norris streets, where some of their sons already served as altar boys. Often they would gather in each other's homes, especially in the home of Lawrence Wiechecki, to pray and talk together. They shared with each other talk about the difficulties in taking the long trolley ride or boat (Wilson Line) to attend Mass at St. Stanislaus - a two-hour trip in each direction! What these men desired, more than anything else, was a Polish priest to administer to their spiritual needs. They knew that the only course to take was to plead their cause before the highest spiritual administrator they could reach. So a committee, composed of Joseph Zoladkiewicz (Baltasar's son), Anthony Zarebski, John Kilanowski and Michael Mielcarek, was delegated to present the hopes and dreams before Archbishop Prendergast. The Poles then numbered only about forty families - about 200 parishioners in all - and Archbishop Prendergast was reluctant to try to form a new parish with such a small flock. The pleas of these Polish pioneers were so sincere and intent, however, that the Archbishop decided to accede to their wishes, praying that his decision would lead to a fruitful and growing ministry among the steadily increasing Polish community. To begin the new work, the Archbishop dispatched the Rev. Mieceslaus Kopytkiewicz to Chester. The year was 1902. The first pastor needed a home, a rectory - so an appropriate dwelling at 4th and Wilson was rented for the purpose. In time of an emergency, the ingenuity of man knows no bounds. In this case the hard-working faithful found no trouble setting up a temporary church. A public hall called "Thurlow House" was used for all church functions. The first Mass was celebrated in the improvised church in March, 1902. The hardy parishioners were heartened to know that now they had a real parish and their own pastor. But the first shepherd of this tiny flock did not stay long enough to enjoy the fruit of his work. After three months, he was called away to work in another diocese. After the departure of its first pastor, the infant parish of St. Hedwig's entered a turbulent period of its history. Amidst turmoil and strife, the tiny flock struggled to keep the dream of a strong, new parish alive. Although written records are scant for these troubled years, we know that in the five years from 1902 to 1907, seven pastors shepherded the tottering steps of this young flock. The Rev. Mark Januszkiewicz succeeded the first pastor - his stay was brief. In due time the authorities appointed a new man, at this "rugged time," in the person of Rev. Dr. John Godrycz. A learned man with some administrative ability, Father Godrycz labored for two years in Chester. He raised his voice for a school and church, both to be built on a lot, located at 4th and Hayes, purchased the year before. And build he did, seeing to the erection of an inexpensive, one-story building, which indeed served both as church and school for the infant parish. When Father Godrycz left the parish, another period of strife ensued. The new pastor, Rev. Frog, just could not adapt himself to the trying conditions and circumstances. For one long, sad year, God guided the parish through its most difficult experience. The Rev. Joseph Biela came to the parish at this time, and administered to it for three months. On September 30, 1905, the parish began to stand on its own feet, so to speak, for there came to the parish a man with an apostolic vision. The Rev. John Zoltowski gave St. Hedwig's its first relief from its trials and tribulations. During his tenure of office as pastor, St. Hedwig's began to enjoy its progress with a feeling of security and stability. During the next three years this zealous pastor scrupulously looked after the growing parish and ordered the building of an additional story - to be used exclusively as a church - to the structure at 4th and Hayes. With the approval and support of his people, he then built the rectory adjoining the combined church and school. The second period - a period of growth - was ushered in by the arrival of the Rev. Leon Wierzynski as pastor of St. Hedwig's. For seven years Father Wierzynski initiated and followed through on a building program to satisfy the growing needs of the rapidly expanding parish. The people accepted the new pastor fully, and the membership increased considerably. A parochial school was started with the Bernardine Sisters in charge. 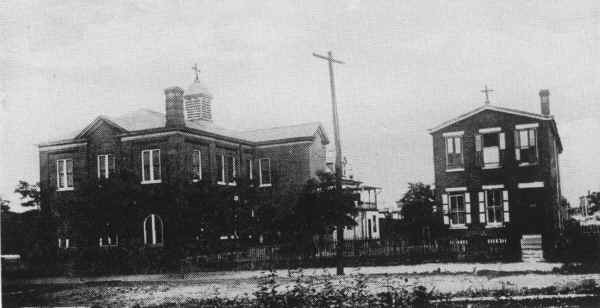 School opened in 1909, with Mother M. Felicitas as the first superior. In 1911 the Bernardines were replaced by the Sisters of the Holy Family of Nazareth. However, in 1917 the Bernardine Sisters returned to teach at St. Hedwig school. It was during the pastorate of Father Wierzynski that purchase was made of the lot where now the present St. Hedwig's church stands. Not long after the purchase, in March of 1915, Father Wierzynski left the parish for other work. Later in life he was to return to Poland where he died in 1946. The third period - what many referred to as the "golden period," one of expansion, greater growth and much construction - began, covering a span of seventeen years, from 1915 to 1932. In 1915 St. Hedwig's was blessed, by the grace of God, with a vigorous, visionary, administratively capable pastor, namely the Rev. Jacob Ploszaj. The properties of the parish can be credited to this visionary priest. Father Ploszaj built the church in 1917. He purchased the beautiful bells in 1918. He was responsible for acquiring the exquisite marble main altar, and for building the school and auditorium. And he provided the Sisters with a comfortable home. He must have had personal courage in his administrative ability and great confidence in his parishioners to accomplish so much in such a trying period in the history of St. Hedwig's. Indeed, Father Ploszaj's ministry at the parish, and all the administrative responsibility, could not have come at a much more trying time. He arrived even as the world was already engulfed in the growing involvement in World War I. President Wilson, who sought only peace as a Presidential candidate, was forced to take the nation into the battle for world survival. When he presented his peace proposals to Congress in January of 1918, he received much support from the people of St. Hedwig's for his insistence on independence for Poland and the Austrian minorities. That same year, the war came to an end. Though the world was at peace, and the parish was able to maintain its slow but steady growth and progress, the Stock Market Crash, in October, 1929, brought. even more trying times to the nation and greatly affected parish life. It was the onslaught of America's worst depression, a depression that made its toll in Chester as everywhere else across the nation. Father Ploszaj ministered as best he could through these early depression years. Then, on November 7, 1932, he was called to his eternal reward and was buried in the grotto in his beloved parish. Father Gabriel Kraus became St. Hedwig's next pastor. As the very trying years continued, Father Kraus tried his best to continue to carry on the administration of the parish, as much as existing conditions would permit, adding slowly to what had already been accomplished. He died on April 4, 1938, and was buried in the parish grotto along with his predecessor. During the period from 1938 to 1952, the final years of St. Hedwig's first fifty - years of renovation, rehabilitation and reorganization - the parish was blessed with a new pastor, the Rev. Dr. Peter J. Klekotka. He, too, like his two predecessors, began his ministry in years of national trials and tribulations. By September 1, 1939, the German army had invaded Poland, and the agony of many in the parish, with families and friends still in the "mother country," was keenly felt. The agony would continue as the nation finally found itself with no plausible alternative but once again forcefully to enter what became the Second World War. Despite the war years, the energetic and dynamic priest immediately did what his people expected him to do. With the able assistance of several exceptional young priest assistants - notably the Fr. Michael Augustyn, a humble but great leader; the Fr. Anthony Jaworowski and the Fr. John Pichia, extremely able organizers and planners; and the Fr. Paul Lambarski, Fr. Sebastian Babiarz and the Fr. Henry Krzywicki, all exceptional leaders and administrators - necessary improvements and repairs were accomplished, the mortgage was liquidated and old organizations started to blossom and new organizations, such as the Holy Name Society and Fatima Sodality, were established, all proving to be lastingly beneficial to the church and the people. The toil, hardship and sacrifice of fifty years were crowned by the splendid spirit created and embellished in the parish by Father Klekotka and his able assistants. It was under the spiritual and corporal leadership of this dynamic priest that everyone at St. Hedwig's felt an integral part of the parish. He brought prestige and influence to St. Hedwig's by his participation in national Polish and religious organizations, and also by taking part in diocesan and local community affairs. In 1952 the parish undertook a Golden Jubilee celebration, with a number of special events culminating, on May 18, in a Solemn Pontifical Mass of Thanksgiving celebrated by Bishop Joseph M. McShea, followed by a Jubilee Banquet in the parish hall. Only a very few of the original parish pioneers were still living at the time of the Jubilee, and to them and others who had already gone to their eternal reward the parish dedicated a Jubilee memorial volume. The year 1952 was eventful in other ways as well. On November 20 of that year St. Hedwig's beloved pastor Klekotka was elevated in rank by Pope Pius XII to become the Very Rev. Msgr. Peter J. Klekotka, J.C.D. The elevation of the pastor was the second reason for a celebration for the parishioners. The third and final celebration came the following month. The Golden Jubilee committee, under the presidency of Joseph Mielcarek, reported a balance of over $5,000 left in the Jubilee treasury after all expenses had been met. The money was put toward the parish mortgage so that, by year's end, the mortgage was burned and the parish became debt-free once again. By 1953, almost half way through Msgr. Klekotka's ministry with St. Hedwig's, records indicate a very thriving and active parish - parish picnics at Savoy Farms, PTA Fashion shows, suppers on a variety of occasions, minstrels, Communion breakfasts. Parish societies and organizations continued to be strong and serve to enhance parish life. The Sodality of the Immaculate Conception, which had taken shape back in 1944, and even before that had its pre-formation through the custom of honoring Mary with a procession and coronation in the grotto as early as 1939, continued as the adopted nickname of "Belles of St. Hedwig." The Holy Name Society, organized with forty men in 1947, was still very active in parish events and continued being responsible for the Communion breakfasts. The Sodality of Our Lady of Fatima, for young married women, organized about 1951, was active in its program of Marian education. The Parent-Teachers' Association, active since its inception in 1940, continued to provide a forum for building understanding between home and school, and activities like the fashion show raised funds for various school needs. And the parish continued to boast of an active CYO, a choir and an ushers organization. Church building and improvements were also active concerns the year after the Golden Jubilee celebration. New sidewalks and steps were put in in front of the church. A new heating system was installed. An addition was made to the rectory to provide more office space and a new school bus was purchased. In May of 1953, Father Reynold Czarnota, son of Walter and Hedwig Czarnota, was ordained to the priesthood. Father Czarnota became the fourth son of the parish to be ordained, and now serves as a chaplain in the United States Air Force. Others before him were: The Rt. Rev. Msgr. Francis J. Palecki, P.A., ordained in 1922 and presently Pastor Emeritus of St. Adalbert's Church, Philadelphia; the Rev. John Sielecki, ordained in 1923, who died in 1967; and the Rev. Bronislaus A. Rutt, ordained in 1932, who died in 1947. Later in the 1950's other young men from St. Hedwig's answered the call to religious vocation. The Rev. Walter Rajmund, son of Joseph and Catherine Rajmund, was ordained in 1956. Father Rajmund is presently pastor of Our Lady of Good Hope Parish, Hope, Arkansas. Then, in 1958, Father Francis Opps, son of Peter and Theresa Opps, was ordained and presently serves as pastor of St. Casimir's Church, Shenandoah, Pennsylvania, in the Diocese of Allentown. Little is formally recorded of these years of the 1950's. One highlight, however, was the visit, on September 24, 1956, of Bishop Gawlina, Bishop of All Polish Refugees the World Over. The visit meant much to the parish, not merely because of its ties to Poland as a mother country but as a symbol of the parish's efforts through the years to sustain the nation and its people left behind. One recalls the early efforts, back in 1920 and 1921 where a parish committee was formed to sell Polish government bonds. Another drive took place later during the early days of the formation of the new Polish government, and again at the time of the severe flood in Poland. Finally, there was the drive for Polish victims of the Second World War. Bishop Gawlina's visit was, indeed, a visible sign of thanks for these efforts. The year 1962 was again a year of renewal and renovation. The 1500 Club was initiated to provide funds for all the renovations needed on the parish properties, and many changes were effected. A new marble altar railing was installed, and marble wainscoating was put in the entire church. A terrazzo floor was installed in the sanctuary, and recessed radiation and a new lighting system were installed in the church. The following year the organ was completely modernized. By 1962 St. Hedwig's had already seen twenty-five years of having an assistant pastor. Father Paul A. Lambarski celebrated the twenty-fifth anniversary of his ordination to the priesthood on May 27, a time of rejoicing at St. Hedwig's. That same month Father John Jagodzinski, son of John and Hedwig Jagodzinski, became the seventh son of the parish to be ordained to the priesthood. Father Jagodinski is presently director of Diocesan Cemeteries. April 21, 1963, was a real milestone year for St. Hedwig's. This was the day set aside for observing the twenty-fifth anniversary of Msgr. Klekotka's pastorate at St. Hedwig's. It was the first celebration of three, at three-year intervals, wherein the parish joined its beloved pastor in recognition of his remarkable life and ministry. In 1966, when Msgr. Klekotka was made Prothonotary Apostolic by Pope Paul VI, he was again honored by the parish with a banquet in a school auditorium. Then, in 1969, the last trilogy occasion honoring this beloved priest was held - a parish banquet on the occasion of the fiftieth anniversary of his ordination. The three joyous occasions were a prelude to the inevitable but sad occasion of 1970. In June that year Msgr. Klekotka retired after serving as St. Hedwig's pastor for thirty-two years of his life. On June 4, 1970, Father Anthony Ziemba was named the new pastor. By 1970, other renovations and changes were seen as inevitable. Renovations had already been made in the parish school in 1964, including new lavatories and a new lighting system, with the latter bringing a donation of nearly $6,000 from the PTA. In 1970 it was again time for church improvements. The exterior was painted, and a new rug was in- stalled in the center aisle and throughout the front of the church. This same year, too, a Polish language school was established, largely through the efforts of the General Sikorski Society. The parish school was once again the focus of attention in 1971. Since its founding in 1909 the school had seen many physical changes, and an enrollment that grew rapidly and forced expansion for many years. By the beginning of the 1950's there were about 400 students attending classes, and about 50 graduating each year. The peak of enrollment was reached in 1960 when some 567 students filled the classrooms, and 81 students were graduated the following spring. After that, as the birth rate declined for the nation, so did the school's classroom bulge begin to ease off. By 1971 there were some 357 students, and a graduating class that year of 39. The changes in 1971 were many, and some as result of the changing school statistics as well as the state of the economy. A new drainage system was installed, and a new used school bus purchased, for $6,300, to transport the 160 students who needed to be bused. The two other school-related "events" were more in keeping with new changes. Recognizing a need for the younger children of the parish, a new kindergarten was begun at the school. For the first time, a modest tuition began to be charged, $15 per student, to help pay for the school costs. On May 17, Father George Ostaszewski arrived to begin his work as the new assistant pastor, the eleventh assistant in the forty-odd years since assistants were found necessary to minister to the growing parish. In 1971, as well, the church's roof and steeple were repaired at a cost of nearly $7,000. Renovation and repair were the order of the day throughout 1972 and 1973 as well: the organ was again repaired and renovated, a new fence was installed between the church and school; the church windows were repaired, costing $10,000; the school roof, the rectory, and the garages were all repaired; the priest's sacristy was renovated; the Lower Hall, including the kitchen, were renovated; and remodeling work on the Sisters' convent was begun. March 12, 1972, marked the twenty-fifth anniversary of the Holy Name Society. It was celebrated with a special Mass and banquet in honor of its contributions to the parish over a quarter of a century. By 1973, St. Hedwig's Parish showed on its roles 1,114 families. Of these, 189 families had children enrolled in the parish school. Archbishop Prendergast's original faith and trust in the forty Polish families who wanted to found a new parish surely bore the fruits he had hoped and prayed for when he granted their request! Father Ziemba, just four years after he began his ministry at St. Hedwig's, was transferred, on June 4, 1974, to St. Laurentius, Philadelphia. Just before that, however, in February of 1974, he oversaw a parish pilgrimage to Fatima, Portugal, a rich spiritual blessing for St. Hedwig's. Father Adam J. Bydlon, our present pastor, arrived in June of 1974. He continued to be assisted by Father Ostaszewski. In addition, Father Bernard Witkowski, who had come to the parish in 1964, continued as resident. The year 1974 was an especially tragic one for St. Hedwig's Parish. On June 19, Msgr. Klekotka, Pastor Emeritus, suffered a stroke. On July 16, he died. The funeral of the 79-year-old pastor emeritus was held at St. Hedwig's on July 20 with His Eminence, John Cardinal Krol of Philadelphia as the principal celebrant of the Mass. Con-celebrants included Father John Klekotka, brother of the pastor emeritus; Father Ziemba, his successor; and the present pastor, Father Bydlon. More than 100 priests attended the services, along with more than 500 parishioners. Msgr. Klekotka's brother, the former president of Villanova University, delivered the homily at the final rites. "I do not plan," he said, "to eulogize my brother this morning. I am sure those who knew him during his life and work are forming a eulogy in their hearts which would far surpass that which I could write in words. My brother loved life and lived it with great intensity. Faith tells us that death is not the end of life, but a passage to a better and higher mode of living." That Msgr. Klekotka had lived life intensely was never doubted by St. Hedwig's Parish. His activity was known far and wide. His strong involvement in city, political and governmental activities had earned him in 1961 the outstanding Citizen Award of the Polish Eagle Citizens Club, in recognition of his humanitarian work in Chester. Many other citations, awards and offices came to him during his fruitful life. Msgr. Klekotka was buried in SS. Peter & Paul's Cemetery, Marple Twp. On April 13, 1975, a Mass was offered at the cemetery chapel on the occasion of the blessing of the marker on the Pastor Emeritus' grave. By the end of 1974 still more property improvement was completed. A new sidewalk was laid on both 4th Street and Wilson Street at a cost of $14,000. The renovation of the Sisters' Convent, begun the year before, was completed. The year 1975 was one of growing excitement throughout the parish. In June, two events marked new milestones at St. Hedwig's. First, the Senior Citizens organized its first meeting, to which over twenty-two Senior Citizens responded. The group elected its first president, Jane Pyrek. That same month, on June 15, 179 people from the parish embarked on a charter flight to Poland. The three-week trip included an eleven-day bus trip to Rome from Poland. The combination of a visit to the "mother country," for many their first visit, and a trip to the Papal city, was rewarding beyond measure. In 1975, Richard Micka, son of Marion and Jean Micka, entered the Trinitarian Fathers and took the religious vows of a Lay Brother. Early in the fall, the exterior of the church was painted and the roof repaired, along with a regilding of the crosses on the church and steeples. By October 30, the renovation of the parish school had also begun. In the Fall, a parish meeting was called to begin discussions about participation in the Eucharistic Congress in August, 1976, and to begin planning for the Jubilee in 1977. By November 13, Mrs. Genevieve Antonelli was elected secretary of the Jubilee Committee; Mr. Albin Chominski, the chairman of the Jubilee Book Committee; Mrs. Teresa Rzasa, the chairman of the Banquet Site Committee. At other meetings, the Jubilee Committee voted to spread the Jubilee Celebration over the entire year, with a Mass of Thanksgiving and Banquet on October 16, the Feast of St. Hedwig. Not to be lost in the midst of the Jubilee planning was the placement of a Memorial Plaque, in honor of Msgr. Klekotka, in the vestibule of the church. By January of 1976 Father Bydlon announced other officers of the Jubilee Committee: Sophie Litwa, chairman; Stanley Stetina, vice-chairman; Wanda Durbano, corresponding secretary; Joseph Swider, treasurer; John Adamski, program committee chairman; Stanley Stetina, liturgy committee chairman; Bert Piscotty, liturgy music chairman; and Robert Klecko, church decorations chairman. In March, a week of Spiritual Renewal, in preparation for the Eucharistic Congress, was conducted by Father Gerard Kotula. On April 18, Our Lady of Fatima Sodality observed its twenty-fifth anniversary with a Mass of Thanksgiving and a banquet. In June, 1976, Father Ostaszewski was transferred to St. John Cantius, Philadelphia, and Father Robert Grudowski was assigned as the new assistant pastor at St. Hedwig's. Father Bernard Witkowski was named administrator of the National Shrine of Our Lady of Czestochowa, Doylestown, Pennsylvania. On June 21, many from the parish joined in the Polish Bi-Centennial Mass in the Cathedral in Philadelphia. July and August of 1976 were renovation months. New desks and chairs were purchased for the parish school, by the PTA. The interior of the church was cleaned, and the interior woodwork on the windows and in the vestibule was painted. August 1-8 were the dates of the 41st International Eucharistic Congress, held in Philadelphia. St. Hedwig's participated in a variety of events during the entire week. Buses left for the Congress every day, and the highlight of St. Hedwig's participation was the Polish Mass at Veteran's Stadium on August 7. Over 500 people from St. Hedwig's attended the Mass. The parish also had a large participation - four buses full - in the closing ceremonies on August 8, at J.F.K. Stadium. Nineteen Bishops from Poland attended the Congress. Two of them, Bishop Vincent Urban and Bishop Bohdan Bejze, visited St. Hedwig's. Bishop Urban offered Mass in the parish on August 8. St. Hedwig's strong participation in the Congress was due, in large part, to the lay leadership in the parish charged with overseeing event coordination: John Adamski and Stan Stetina, co-chairmen, and Genevieve Antonelli, secretary. Late in the year, in preparation for the Parish Jubilee, the altar candlesticks, tabernacle doors, altar gates and sanctuary lamps were regilded, and the church pews varnished. Also, through the efforts of our school children, new curtains for the stage of the parish auditorium were purchased, costing $1,600. In November the Czestochowa Trust Appeal began at St. Hedwig's. With the Children's Christmas Play, in December, St. Hedwig's Jubilee Celebration was initiated, attended by over 600 persons. In 1977 St. Hedwig's is observing its seventy-fifth anniversary. The Jubilee Year Celebration is programmed to observe a Jubilee-related activity each month throughout the year. The Celebration began on January 9, with a Con-celebrated Mass and an Oplatek Supper. The theme of the celebration was St. Hedwig's as a Parish Family. The principal celebrant of the Mass was Msgr. Francis Palecki, pastor emeritus of St. Adalbert's Church, Philadelphia, and the first priest son ordained from St. Hedwig's. Concelebrants included priest sons of the parish: Father Ray Czarnota, Father John Rajmund, Father John Jagodzinski, also, Father Bydlon, and a number of priests who had served at St. Hedwig's over the years: Fathers George Ostaszewski, Bernard Witkowski, Sebastian Babiarz, Paul Lambarski, Francis Gwiazda. Msgr. Anthony E. Jaworowski, former assistant, was the homilist. Father Robert Grudowski, assistant pastor at St. Hedwig's, was the master of ceremonies. Guests at the Mass included Sisters who entered the religious life from St. Hedwig's, Jubilarians who are members of St. Hedwig's for the entire 75 years of its existence, officers of each parish organization and children from each grade in St. Hedwig's School. St. Hedwig's choir, under the direction of Mr. Bert Piscotty, sang during the Mass. The church was filled to capacity. After the Mass, an Oplatek Supper was held in the parish hall. The highlight of the supper was the breaking of the traditional "Oplatek" (wafer) at the meal as a sign of love and affection for each other. Foods traditionally served at the Christmas Eve meal were served to the capacity-filled hall, with over 600 persons attending. A special feature of the Supper was the presentation, by St. Hedwig's school children, of the traditional Wigilja Supper in Polish. The program included dancing by the PNA Dancing Group. Audience singing of Christmas carols was led by Nancy Tokarowski. The February, 1977, Jubilee Celebration included a parish social called "Nostalgia Day." The keen interest in the day led the Jubilee Committee to plan another Nostalgia Day later in the year when the weather would be more favorable. Featured at this celebration were the pictures of most recent celebrations dating back to 1902. Movies of parish activities in the past were shown by John Adamski. Manifestation of the love and devotion to Our Lady, long a characteristic of St. Hedwig's, was the pilgrimage to the shrine of Our Lady of Czestochowa, Doylestown, on March 26 and the participation in the Jubilee Year May Procession in May. The response to these events were indicative of the strength of the devotion to the Blessed Mother at St. Hedwig's. Expressing our Jubilee Year theme "Our Parish as a Family" was the beautiful response to the Swieconka Supper on April 21. Sharing the blessed "Jajko" (Egg) as a sign of love and affection was a hi-lite of this Jubilee Year celebration. The Jubilee Year Pilgrimage to Poland from June 26 to July 10 was indicative of the strong ties existing between St. Hedwig's and the people of Poland. Many nice things happened to our Pilgrims in Poland. Unforgettable was the Con-celebrated Mass at the residence of Cardinal Wyszynski on June 28th. His Emminence welcomed our group very affectionately and spoke of the strong faith that binds our people. Equally significant was the Jubilee Year Mass at the altar of Our Lady, at the Shrine of Our Lady of Czestochowa, Poland. Bishop Bohdan Bejze, Auxiliary Bishop of Lodz, Poland, was the principal celebrant of the Mass. Fr. Bydlon con-celebrated the Mass with Bishop Bejze. For many of our pilgrims, the meeting with Cardinal Wyszynski, the Mass at Czestochowa, touring Poland and visiting relatives was a beautiful, long to be remembered experience. The Jubilee Year theme "Our Parish as a Family" was beautifully expressed at the Jubilee Celebration on October 16, the Feast of St. Hedwig. At 9:00 a.m., Fr. Bernard Witkowski offered a Mass of Thanksgiving for the youth of our Parish. Participating in the Mass were the youth of our Parish as lectors, singers, offertory gift bearers, altar boys, cub scouts, scouts, and girl scouts. Guitar accompaniment was provided by Beth and Jane Teofilak. The participation of our youth was a beautiful tribute to our Founding Fathers and indicates how well the seed of faith was planted and nourished at St. Hedwig's over 75 years. Bishop Thomas J. Welsh, Bishop of Arlington, Va., was the principal celebrant of the Mass of Thanksgiving at 2:30 p.m. Concelebrants included Fr. Bydlon, Fr. Jagodzinski, Fr. Opps, Fr. Klekotka, Fr. Babiarz, Fr. Witkowski, Fr. Ostaszewski, Fr. Gwiazda. Fr. Anthony Ziemba was the homilist. Fr. Robert Grudowski was the Master of Ceremonies. The impressive procession to the Church included Daughter Nuns, altar boys, school children, officers of all parish organizations, Jubliarians, Jubilee Executive Committee, lectors, and Knights of Columbus. Lectors of the Mass were John Adamski and Albin Chominski. Commentator was Stanley Stetina. Representatives from the Rosary Society, Third Order, Jubilarians, and Sisters presented the offertory gifts. Petitions were read by Presidents of parish organizations. The Parish choir, under the direction of Mr. Piscotty, sang the Mass in Latin, English and Polish. 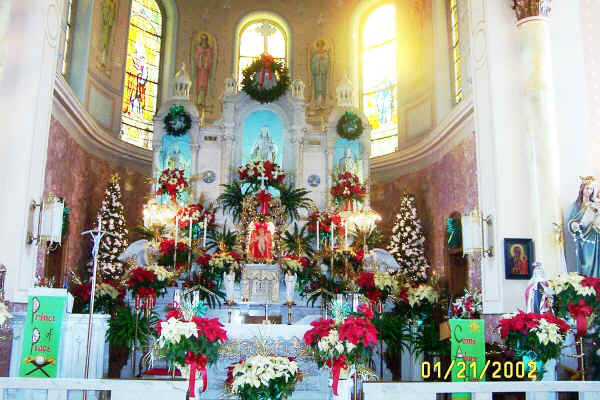 The beautiful altar decorations were the untiring efforts of Bob Klecko, C. Kozak and J. Iannelli. Guests priests included Msgr. Palecki, a priest son, Msgr. Statkus, Msgr. Naja, Msgr. Jaworowski, Fr. Paul Lambarski, Fr. Michael Capuano, Fr. Francis Bonato, Fr. Thomas Gardocki, Fr. Peter Keenan, Fr. Peter Lypyn, Fr. Mitchell Wilk, Fr. Jacob Biernacki, Fr. Musial, Fr. Muldoon, Fr. Frank Krajewski, and Fr. Joseph Klosinski. At the Jubilee Banquet following the Mass in the Parish Hall, Mrs. Sophie Litwa greeted the guests. Miss Irene Darlak sang the National Anthems of the United States and Poland. Msgr. Anthony Jaworowski was Master of Ceremonies. Mr. Anthony Przedzial, a Jubiliarian, spoke for the parishioners of St. Hedwig's. Bishop Welsh spoke at the Banquet and Fr. Bydlon expressed his thanks to the Banquet Committee, to all guests present, to all parish organizations, and to all parishioners for supporting the Jubilee Committees efforts in making our 75th Anniversary a memorable one in the history of St. Hedwig's. This concludes the 75th Anniversary phase of our parish history. Our prayer is that 75 years of courage, dedication, loyalty to the Church, and sacrifice will inspire this generation and generations to come with an even greater loyalty and service to the Community of Faith that is St. Hedwig's. SERVING THE COMMUNITY OF FAITH was the theme and inspiration that was used throughout the preparation for the 75th Anniversary. The last paragraph of the History of St. Hedwig's follows: "This concludes the 75th Anniversary phase of our parish history. Our prayer is that 75 years of courage, dedication, loyalty to the church, and sacrifice will inspire this generation and generations to come with an even greater loyalty and service to the community of Faith that is St. Hedwig's". CENTENNIAL OF FAITH is the theme and inspiration for the preparation of the 100th Anniversary Jubilee Celebration. In 1978, Father Adam J. Bydlon was our Pastor and Father Robert J. Grudowski was the Assistant Pastor. Two hard working priests that provided support, guidance, and encouragement to all organizations and parishioners. They helped to make things happen. At the Oplatek supper, movies of the 75th Jubilee Celebration Mass and Banquet were shown. Senator Bell presented a Resolution passed by the State Senate, honoring St. Hedwig's on the occasion of its 75th Anniversary. Polish language classes were started by Bert Piscotty. Scout leaders and scouts of Troop 86 were congratulated on their 25th Anniversary. The scouting program was very active, successful, and productive. Total of 15 boys reached the rank of Eagle Scout. The program was led by dedicated men and women like Joe Glowacki, Bill Sheeky, Stan Kokoszka, Stanley Kogut, Jake Mieka, Joseph Igielski, Joe Winiarski, Sam Durbano, Ron Sweigert, Ted Sikora, Emil & Cecilia Wolanin, Michael & Natalie Wiciak, Frances Kwapisz, Verna Yurkonis and others. 1978 was a busy year. Two hundred (200) men attended an annual Holy Name Communion Breakfast. Weekly bingo and 1500 club provided financial support. Our Easter offering totaled $12,536.00. Father Reynold Czarnota's 25th Anniversary Mass was celebrated at St. Hedwig's. Father was a chaplain in the U. S. Air Force. Father Bernard Witkowski had been named Pastor of St. Ladislaus Church, Philadelphia on June 7, 1978. Our annual parish bazaar netted $8,663.00. Father Bydlon led a trip to Hawaii, accompanied by 52 parishioners. Father Sebastian Babiarz, Assistant Pastor of St. Hedwig's from 1963 -1966 died August 10, 1978. Pope John Paul II was elected as our new Pope. The annual Pulaski Day Parade was held in downtown Chester, PA on October 15,1978. Parish sponsors a Girl Scout Program. Lady of Fatima paid $1,100.00 for installation of new linoleum in both church sacristies. PNA Group 650 celebrated its 75th Anniversary with Mass and Banquet at the hall. Christmas offering totaled $ 14,940.00. CYO started to provide our parish with an effective and active program for the youth. This program was led by dedicated men and women like Sam & Wanda Durbano, Jerry & Mickey Schad, Anthony Kwiatkowski, Brian Litwa, Robert & Mary Weigand, Ziggy & Jane Sendek, Ann Maitland, Susan Kozlowski, Barbara Ellis, John & Sophie Adamski, Pat Clements and others. During 1979, parish activities continued. The Polish Eucharistic Choir sponsored a Banquet honoring St. Hedwig's Choir with Mass followed by a Banquet and Dance in the parish hall. The Home & School Association held its annual fashion show at the Brandywine Club. The school children held a successful candy sale. They sold 12,000 bars and the sale netted $4,000.00. Father A. Bydlon was transferred to St. John Cantius Parish, Bridesburg, Philadelphia, PA. He was replaced by Father Reynold Czarnota, a priest son of the parish, effective June 6,1979. Farewell and reception were celebrated with Mass and socials at the hall. Within one month of Father Ray's arrival, you could see a difference in the administration of parish business. He started publishing attendance numbers at Sunday masses and total contributions with comparison to like Sundays for the previous year. A listing of needed repairs to the parish buildings also published. He wanted the parishioners to be aware of the financial requirements for the operation and maintenance of all the buildings, pastoral and school costs. The Chapel in the old school building was opened on November 5, 1979, for daily masses with seating for about 50 people. The chapel eliminated heating the church and use of lights for daily mass. The harvest dance was held in October with Rich Korenkiewicz acting as chairman. Christmas 1979 collection totaled $15,262.00. In 1980, work was started to repair, restore, and refurbish our stained glass windows and to install lexan protective coverings for an estimated cost of $40,000.00. Also, to install a new heating system in the new school and auditorium at an estimated cost of $40,000.00. Financial drives were started to help pay for these large expenses. Parishioners were requested to donate specifically toward these two major repairs. The Sunday bulletins published all contributions of $30.00 or more. A fund drive was started called the "Million Dollar Adventure". Tickets cost $2.00 for 24 weeks. To cool the church in the summer, fans were installed as well as exhaust fans in the towers and the basement Adam Slezak chaired the annual Catholic Charities appeal. The St Hedwig's men attended the annual retreat to Malvern. The Holy Name breakfast was held at the parish hall. Father John Jagodzinski was the featured speaker. Our 40 hours closing was attended by 50 priests, who were served a delicious dinner by our senior citizens. Due to a shortage of priests, the priests from St. Hedwig's and Resurrection parishes were assigned chaplaincy duties at Sacred Heart Hospital. The Holy Name Society sponsored a Gala New Year's Eve Party. 1981 to 1990 -During this decade, the religious and social activities flourished and the different organizations supplied support with their participation in the communion breakfasts, dances, bazaars, picnics, trips, parties, fashion shows, school activities, and holiday events. It was also a period where the immigration from Poland was slowing down. The grammar school student body was decreasing and the younger people were moving to the suburbs. The heritage, spirit, and the faith of the parishioners did not diminish and was always displayed in their attendance at mass and their financial support through various funding drives that were instituted to supplement the income of the parish. In 1981, Robert Klecko was selected by the Kosciuszko Foundation for enrollment in a special six-week session for the study of Polish culture and language at the University of Krakow. Bob left on July 11, 1981. The year was featured by name band dances, Holy Name picnic at Archmere, Home & School fashion show, casino trips, CYO and Scout activities, Fatima communion breakfast and parish bazaar. 1982 - In addition to our annual activities, a bus trip to Schubert Theatre in Philadelphia was arranged to see "our own" Arlene Kulis in the show" ANNIE". Father Robert Grudowski was appointed as Pastor ofSt Josaphat's Church, Manayunk, PA on 2/17/82. Father John Sitko became the Assistant Pastor of St. Hedwig's on 2/17/82. Father Paul Lambarski, Pastor of St. Josaphat's died 2/17/82. 1983 - Mr. Jan Lewan visited St. Hedwig's and sang with our choir on Easter Sunday 4/3/83. Annual Polish Constitution Day ceremonies took place on 5/3/83 at the Chester Colonial Courthouse, sponsored by the United Polish Societies. Father John Sitko was transferred to St. Laurentius parish, Philadelphia on June 5,1983. Father Jerome Pohl became the Assistant Pastor at St. Hedwig's on June 5, 1983. He transferred from St. Laurentius parish. 1984 to 1989 - In September 1985, the Holy Name Society was reorganized and started monthly meetings and other church activities, under the guidance of Paul Pinkoski as President and Albin Chominski as Secretary-Treasurer. In July 1985, Sister Bernadette Glodek, a parish daughter, was appointed as Assistant Superintendent of the Archdiocese of Washington, D.C. David Korenkiewicz graduated from medical school with honors. In September 1986, the increased offertory program was started. Albin Chominski and Boleslaw Wojewodka served as co-chairmen for this project. A total of approximately 200 parishioners volunteered to serve on committees and as solicitors. Every member of the parish listed on parish records was personally contacted. This program resulted in many names being dropped from the list of those to receive envelopes and who would not be considered eligible for any future service from the parish. Weekly contributions increased on average from $3,000.00 to $4,000.00. In 1987, our 85th Anniversary was celebrated by a special mass and by a couple of Polish Heritage Dinner Dances held in the auditorium. In February 1988, Archbishop Anthony J. Bevilaqua came to Philadelphia diocese to replace Cardinal Krol. Adam Slezak, Joan Abrams, Stanley Stetina, Tom Murphy, Stanley Rzucidlo and Ginger Antonelli once again managed the Catholic Charities Appeal. It is to be noted that the parish met or exceeded the Diocesan goal on this and all other charity appeals. On May 29, 1988, Boleslaw S. Wojewodka was ordained as permanent Deaconate. St. Hedwig's was the first Polish Parish in the Archdiocese to have an ordained permanent deacon. 1989- On November 16, 1989, the day of the infamous tornado, severe damage was done to the church. The tornado destroyed our two largest windows in the sanctuary area, also damaged our two steeples. Estimated cost $70,000.00 each window and $52,000.00 for the steeples. Insurance covered a small portion of the cost. It was determined that the original windows could not be replaced so the windows were repaired and covered by plain Plexiglas. 1991- The Diocesan fund drive "Catholic Life 2000" was started. It was co-chaired by Albin Chominski and Rev. Mr. Boleslaw S. Wojewodka. St. Hedwig's was assigned a goal of $220,000.00. The highest goal of all Chester parishes. This diocesan goal was determined by a formula based on parishioners' weekly contributions. The parishioners were requested to make signed pledges, payable over a period of five (5) years or less. As of March 31, 1992, St. Hedwig's parishioners pledged $191,300.00. 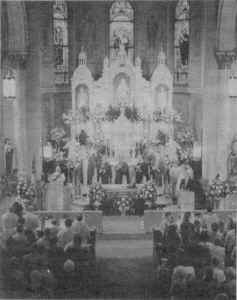 1992 - St. Hedwig's Parish celebrated its 90th Anniversary. On September 27, 1992, the most Reverend Louis A. DeSimone, D.D. Auxiliary to the Archbishop of Philadelphia, celebrated a mass of Thanksgiving. Reception and dinner followed at the Ramada Inn, Essington, Pennsylvania. Dr. John A. Kaczenski chaired the Anniversary committee and the Banquet chairman was Judy McCloskey. A letter from the Cardinal, dated September 27, 1992 to Reverend Reynold A. Czarnota, stated the following: "On the happy occasion of the ninetieth anniversary of the founding of St. Hedwig's Church, I am grateful for the opportunity to express my sincere congratulations and prayerful best wishes. As you reflect with gratitude upon your glorious history, you can also look to the future with hope and confidence". 1991 to 1993 - These were the years that can be characterized as the darkest years St. Hedwig's Parish has encountered in its 100-year history. Our faith, heritage, strength, passion, and love of God have been severely tested by this diocesan command. "St. Hedwig's will be closed". A brief synopsis of events follows, but detailed letters, bulletins, reports, and newspaper articles covering the planning, decision-making, proposals, meetings, demonstrations, personal letters are available in historical files. The first indication of what the future may hold for the churches in Chester was that in 1990, the diocese prepared a selected data of items for the Chester planning area of five elements of a faith community for the city of Chester. In November 1991, the diocese established the "Chester Regional Planning Steering Group" with representatives from each parish, plus the diocese. The group met monthly. Rev. R. Czarnota and Sister Mary Austin, our school principal represented St. Hedwig's. This group was charged to come up with ideas, to review the problems, and suggest solutions. Also to inform parishioners on progress being made and to include their ideas into the overall planning process. On December 15,1992, after a year of meetings, the Chester Planning Committee reported the following: There have been many opportunities for the Catholic Community to provide input and express their opinions. People have been heard. The proposal has been finalized. It went through many drafts. The proposal is being forwarded to the Cardinal. We do not expect to hear from him before March 1993. 1. All our six (6) parishes be suppressed and one (1) new parish be established with a new name. 2. One worship site at St Robert's, but Sunday worship continues temporarily at Immaculate Heart, St Anthony and St Hedwig. 3. Six rectories be consolidated into one at St Robert's. 4. Six administrative offices consolidated into one at St Robert's. 5. One convent at St Robert's. 6. Three schools be consolidated into one at St Robert's. 8. 1996 and after - one parish (St. Robert's) and one worship site (St Hedwig's) the only secondary worshipping community. As the result of the above recommendations, St. Hedwig's Church was notified by a letter dated June 14, 1993 signed by the Cardinal. "After prayerful reflection and a lengthy process of consultation, the difficult decision to suppress St Hedwig's Parish has been made. I write to convey formal notification that this suppression will become effective July 1, 1993". "Given the dwindling number of faithful at St Hedwig's Parish, the spiraling costs of maintaining the parish and in view of our serious shortage of priests, the suppression of St Hedwig's Parish is the only feasible course of action. The following measures will be affected in the process of suppression: St Hedwig's Church will be closed as of July 1, 1993. Provision for worship at the present site of St. Hedwig's Church will; however, be permitted not beyond January 1, 1996. The sacramental records of St Hedwig's Church will be kept at Blessed Katherine Drexel Church. During the tumultuous years of 1991 to 1993, under their motto "St. Hedwig's Forever", the parishioners refused to accept the fact that they should lose their church. The church that was built by their forefathers and for their love and faith in God, and their willingness to sacrifice their time and treasure for a large part of their life, the very thought was incomprehensible. They became stronger in their faith and heritage. Supported by their beliefs and faith, they became a prayerful and vocal family. Led by the younger parishioners, Sam & Wanda Durbano, Judy McCloskey, Mickey Schad, Bob Klecko, Sophie Litwa, Helen Nowak, and hundreds of others. The parishioners attended all open meetings in large numbers and voiced their objections and suggestions. Wrote letters to the Chester Steering Committee, conducted protests at various churches where special Masses were taking place. Contacted politicians and requested their support. Encouraged parishioners to express their feelings by letters to the diocese and anyone else that could help, even the Vatican. Published critical cartoons in the newspapers, placed paid ads in various publications, such as Delaware County Daily Times, Philadelphia Inquirer and Polish National publications. Organized a 60-member live candlelight human rosary outside of St. James High School while a meeting concerning the closure was going on. Requested help from the Polish American Congress, which published a supporting article in the Daily Times, and also resulted in a private meeting between the Cardinal and the President, Mr. Michael Blichasz. Mr. Blichasz personally presented the trauma and the deep feelings and concerns that we have for our church, Polish heritage, and the love of God. In 1993, after receipt of the June 14, 1993 Cardinal's suppression letter, it was determined by the parishioners, that a central unified organization was needed and would be most effective in presenting arguments, opinions, facts, and in expressing and demonstrating the parishioners side of the story. The Polish American Heritage Association of Delaware County, St. Hedwig's Society, was formally established with a constitution and by-laws with the following mission: "This association offers to all of Polish descent throughout Delaware County and surrounding communities an organized body interested in promotion of all activities which perpetuate the spirit, fellowship, customs, and Polish traditions handed down to us from our dedicated ancestors". PAHA is presently led by President, Sam Durbano; Vice President, David Chominski; Secretary, Judy McCloskey; and Treasurer, Mickey Schad. Board Members represent all organizations of St. Hedwig's Chapel. 1993 - Under the administration of Blessed Katherine Drexel, Sunday masses were scheduled at 9:00 AM in English and 10:30 AM in Polish. Daily masses in the chapel at 7:00 AM in English. Administrator: Rev. John B. Wendrychowicz, Associate Pastors, Rev. Edward Hallihan and Rev. Russell J. Donnelly. This arrangement was in effect to June 5,1994. 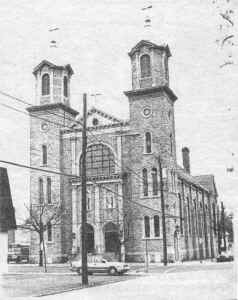 1994 - St. Hedwig's became a worship site, a Chapel, and a part of Sacred Heart Parish, Clifton Heights, PA. On June 26, 1994, Rev. Father Francis Barszczewski became the pastor of Sacred Heart Parish. Rev. Jan Palkowski, Assistant Pastor, and Msgr. Francis J. Urbanowicz, Pastor Emeritus. Father Frank and Father Jan met with the parishioners from St. Hedwig's Chapel, in the social room, on June 28, 1994. He assured the parishioners that most things in the parish would remain the same. Masses on Sunday 9:00 AM in English, 10:30 AM in Polish. Weekday masses at 7:00 AM. Weddings and baptismals to be discontinued. Last wedding at St. Hedwig's took place in November 1994. Rev. Mr. B. Wojewodka became officially the deacon for both Sacred Heart Parish and St. Hedwig's Chapel. 1996 - Quarterly meetings were and are being held by all parish members, finance, council, and pastoral council are being held to discuss common problems and parish business. On September 15, 1996, St. Hedwig's parishioners completed a survey to decide several suggestions on mass schedules. The parishioners voted for 9:00 AM mass in English and 10:30 mass in Polish. 1997 - At the January 23, 1997 parish meeting, repairs to St. Hedwig's church roof were discussed. A bid of $ 18,840.00 was received but possibilities of additional damage and cost would have to be considered. On August 10, 1997, it was determined that a permanent Repair Fund Committee should be established. Albin Chominski, Dr. John Kaczenski, John Sarnocinski, and Adam Slezak were appointed to serve. Joseph Sewruk was appointed to the committee to replace John Kaczenski. Since inception of the committee to current date, we have expended $52,000.00 on indoor repairs and $104,000.00 on outdoor repairs. Major outdoor repairs were done to the roof, parking lot, windows, and church structure. Indoor repairs were paint and plaster, bells, sound system and carpet. Judy McCloskey, David Chominski, and Dr. John Kaczenski were elected to serve on the Parish Council. 1998 - On April 29, 1998, Pope John Paul II conferred the pontifical honor of Honorary Prelate to his Holiness with the title of Reverend Monsignor on our Pastor Rev. Father Francis Barszczewski, investure ceremonies took place on June 14, 1998. 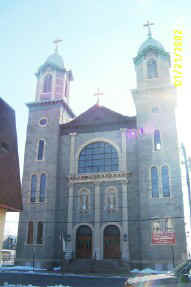 A reception took place on June 20, 1998 at the Sacred Heart Parish Hall. Father Reynold Czarnota, our beloved Pastor, died on January 22, 1998. 1999 - On Sunday, June 6, 1999, the Vicar of Delaware County, Rev. Thomas J. Smith visited St. Hedwig's Chapel. After mass, he attended a breakfast social in the social room and visited with the parishioners. On July 4, 1999, a bilingual mass on Sunday was started at 9:30 AM. Wanda Durbano was elected to serve on the Parish Council. 2000 - Barbara Ostapowicz and Frances Kwapisz were elected to the Parish Council. Rev. Father Jan Palkowski was transferred from Sacred Heart Parish to St. John Cantius Parish, Philadelphia, effective October 18, 2000. This transfer left Sacred Heart Parish with one priest, Msgr. Francis Barszczewski. Daily mass at St. Hedwig's was discontinued. The shortage of priests has become relevant. Thanks to the Almighty God, our good friend and benefactor, Msgr. Francis Feret, from St. Adalbert's Parish, has been providing a Polish priest, Rev. Jerome H. Pohl and Rev. Thaddeus Gorka, to celebrate Sunday Mass and some funerals. Also, retired Rev. Father George Ostaszewski has volunteered his services. In these trying times, we cannot overlook our "God’s Little Helpers", who have stepped forward and contribute their labor and time to help St. Hedwig's Chapel to function. Bob Klecko, Catherine Kozak, John & Rose Ozor, Eva Zielinski, Dr. John Kaczenski, Francis Kwapisz, Judy McCloskey, Mickey Schad, David Chominski, Nancy Tokarowski and her choir angels, Sam Durbano, Edward & Robert Ostapowicz, Edward & AJ Rich, Brittany Carey, and Jason McCloskey. Ginger Antonelli, Parish Secretary and Brian Litwa, Janitor and Property Caretaker. 2001 to 2002 - Sylvia Lyszczek was elected to the Parish Council. In the latter part of 2001, planning and preparation for the celebration of the 100th Jubilee celebration was started. Judy McCloskey and David Chominski are co-chairmen; Wanda Durbano, Secretary; Mickey Schad, Treasurer. Various committees were selected and monthly meetings were started. Various social and moneymaking activities were planned to help alleviate expenses. The first event was the Anniversary Opening Mass held on November 9, 2001. A weekly 50-50 drawing was initiated. Other events held to date were Roast Beef Dinner, Paczkowy Bal, Spaghetti Dinner, Swieconka Breakfast. Miscellaneous drawings were and are taking place. Memorabilia pictures are being posted in the social room depicting historical events and former and present parishioners. Led by the Rev. B. Wojewodka, Majowka (Evening Prayers with Our Lady) was held every Wednesday and Friday evening during the month of May in the Grotto area. A beautiful service with rosary and polish songs dedicated to our Blessed Mother Mary. Enjoyed by an average of 28 parishioners. May procession was held in Church due to rain. After Mass, a light brunch was held in the parish social room. In June, a casino trip was run by the United Polish Societies to Atlantic City. Parishioners participated in an outdoor Corpus Christi (Blood of Christ) procession led by our Shepherd Rev. Father George Ostaszewski. This was a windy but a sunny morning. A good group was in attendance. Tickets for the 100th Anniversary Banquet to be held on November 9, 2002 at the Holiday Inn Select in Claymont, Delaware went on sale in June. Four hundred tickets were sold in eight days. Due to the great interest to attend the banquet, more tickets had to be ordered and more dining space had to be set up to accommodate the overflow of guests. Summer 2002 was a hot summer and all were eagerly looking forward to a festive celebration in November. October is Polish American Heritage Month and over eighty faithful from St. Hedwig's walked or rode a trolley in the Pulaski Day Parade in Philadelphia. The parishioners and friends of St. Hedwig's walked with the Polish National Alliance Division. A float honoring Saint Hedwig was created with beautiful pictures of St. Hedwig and St. Hedwig's Church. This parade was televised on Channel 6 WPVI so thousands of TV viewers saw that we were celebrating 100 years serving the Community of Faith in Delaware County. Polish National Alliance Lodge 650 held a breakfast in the social room celebrating Polish American Heritage Month. Saturday, November 9, 2002, a bright sunny, warm day, a Mass of Thanksgiving celebrated by Pastor Rev. Monsignor Francis Barszczewski and concelebrants Rev. Monsignor John Jagodzinski, Rev. Father Francis Opps, priest sons of the parish, along with Rev. Monsignor Bernard Witkowski, Rev. Monsignor Francis Feret, Rev. Monsignor Robert Grudowski, Rev. Father Jerome Pohl, Rev. Father Jan Palkowski, Rev. Father Joseph Zingaro, Rev. Father George Ostaszewski, and Deacon Rev. Mr. Boleslaw Wojewodka. Unfortunately, there was no representation from our Archdiocese. An invitation was declined by the Archbishop Cardinal Anthony Bevilaqua. The Church was beautifully decorated by Robert Klecko. The Centennial choir, known as St. Cecelia Choir of St. Hedwig's, under the leadership of Nancy Tokorowski led the congregation with Polish hymns. Parts of the Mass were said in English, Polish, and Latin. Most pews were filled with Bernadine Sisters of St. Francis, daughters of the parish and past teachers of St. Hedwig's, parishioners, friends, representatives of Polish American Congress, Eastern Pennsylvania District, children dressed in Polish costumes, and neighboring pastors of the Orthodox Rite. In attendance were Rev. Father Gerald Ozlanski from Saint Mary's Ukrainian Orthodox Church and Archpriest Vincent Severino from Saint Nicholas Russian Orthodox Church. Following the Mass, a banquet was held at the Holiday Inn Select Hotel in Claymont, Delaware with six hundred fifty guests. A room was set up as a memorabilia room called "walk down memory lane" with pictures of old and recent events and history of St. Hedwig's Church. Rev. Monsignor Bernard Witkowski was the main speaker. Monsignor Bernie spoke of the people and their love of Saint Hedwig's and their faith. The guests were treated to a performance by the Polish Intercollegiate "PKM" dancers with dances of Poland. "Our Gang Orchestra" provided the music for the evening. Many people traveled a distance as far as Arizona, Virginia, and Massachusetts to come home for this great celebration. The day was a success! The love for their Church, St. Hedwig's, inspired the committee members and parishioners to work hard for two years to make this event a success. As we begin our next Hundred Years, we ask God to continue to bless us with faith, love and pride in our rich Polish Heritage. 1 - Thanks to Ed Rumford, Sr., rumfoe@earthlink.net, for this information. © 2000, 2001, 2002, 2004, 2006 John A. Bullock III.